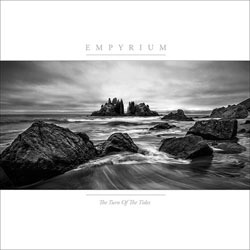 In tandem with “The Turn of the Tides“, the collected works of Empyrium will be released on vinyl as a lavish box set. The box set “1994 – 2014” includes Empyrium’s entire recordings on nine vinyl discs, starting with the demo “…der wie ein Blitz vom Himmel fiel…” right through to the latest album “The Turn of the Tides“, meaning also the four regular studio efforts, the exclusive tracks from the compilation “A Retrospective…” and the “Into the Pantheon” concert. In addition, the box contains seven Empyrium-posters as well as a large-sized booklet with all lyrics (including those from “…der wie ein Blitz…” and “A Wintersunset…“, which have not been published so far). All components were furnished with a stylish, entirely new layout by Fursy Teyssier (Les Discrets). Moreover, he has drawn new cover artworks on occasion of this release for the classics “A Wintersunset…“, “Songs of Moors And Misty Fields“, “Where at Night the Wood Grouse Plays” and “Weiland“. The box itself is made of pine and beech wood from Empyrium’s home in Rhoen / Franconia and comes with an embossed Empyrium branding. “1994 – 2014” is limited to 500 copies and can be pre-ordered here.